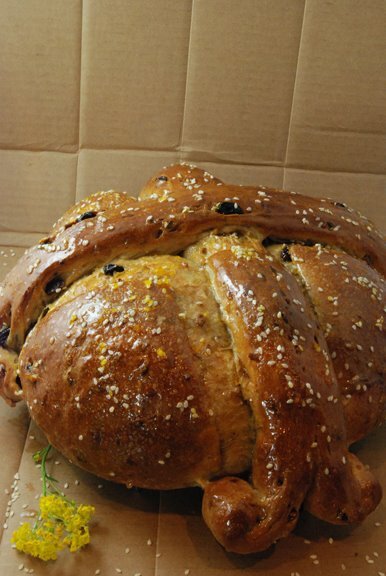 The Greek Celebration Breads are sweet breads served at holiday times such as Christmas, Easter and New Year's. This week I made the Greek Christmas Bread called Christopsomos Bread. The holiday recipes are generally made using the base "Greek Celebration Bread" and then fruit and nuts are added. I chose to make the Christopsomos bread in part because I'm a big fan of raisin bread and hot cross buns, and also because of its curly cue appearance. Today though I was in the mood for something a little different, so I replaced the fruit with raisins and swapped walnuts out in favor of pecans. Yum! This recipe suggests that authentic Greek spices can be used. Spices such as Mastic and Mahleb (which is extracted from Santa Lucia cherry pits) could replace all the spices found in the recipe.) Unfortunately, I couldn’t find either locally, so here is the North American version. You can find the recipe for Greek Celebration Bread in the book The Bread Baker's Apprentice: Mastering the Art of Extraordinary Bread. To see how the rest of the BBA (Bread Baker's Apprentice) Challenge group fared with this week's recipe, click here and then click on each blogger! I'm not listed there since the group grew to 200 (the cutoff point) too fast. I'll join in now and then, though. First of all the appearance of this bread is amazing with its Christmas cross in the center and then swirls reminiscent of the elaborate columns found in ancient Greek architecture decorated with sesame seeds and honey glaze. Appearance-wise alone, this bread would draw out a chorus of oohs and aahs if served at a big family brunch. So, what about the taste? Sweet and delicious! The raisins fit very nicely with the complex combination of spices in this bread, which was very reminiscent of hot cross buns. In all, I really enjoyed this bread and can't wait to serve it next Christmas! What an absolutely gorgeous bread! The sheen, the rise, it looks perfect! Wasn't this amazing? I loved the way it smelled when I was kneading mine (not to mention how it smelled when it was baking, and when it came out of the oven, and...) and I was surprised that the shape came together so (relatively!) easily. Yours is beautiful! AH! Yes... I love the Greeks, especially when they come with food (or ouzo! LOL)!!! This is surely beautiful enough to have anyone break into "Ta Pedhiá tou Pireá" ("Children of Piraeus", know the song?) LOL LOL!!! Love raisin anything too... if only I was able to bake bread, I'd be able to enjoy this... (snif). That looks terrific! I want to try this again with raisins--I just made the basic recipe, since I wasn't sure if my kiddos would like it. I went with a braid, and it was enormous! It is certainly ooh and ahh worthy. Love that shape. It's so pretty--the color, the glaze, the curly-cues. All of it! Wish I had a piece with salted butter! This looks so incredible! the golden glow, the curvaceous twists -- amazing photo--love the rustic backdrop! I'm loving the BBA group! Watching you guys bake these fabulous breads has me wanting to whip my yeast out of the pantry. This Greek celebration bread looks absolutley delicious. I love a bread with a good spice to it. Great job! i wish i could also try to taste this one..
What a pretty loaf! That is a celebration bread. Sounds delicious with the spices and orange zest. Great job! Woo hoo another successful Christopsomos! I never even attempted to look for the greek spices and just grabbed the ones I already had in the spice cabinet. Your Christopsomos looks perfect! I really loved the flavors of this bread. Ha - you joined another baking group, too! Like you, I loved this bread, and will be making it again. I am huge fan of baking bread. There is something absolutely soul satisfying about it. I can't wait to try this recipe! Your loaf is gorgeous! The shape is perfect. Yours turned out so lovely! We loved this bread...I post mine on Monday as I am doing it with the slower group. Such fun that you are doing this, too. I love the cross decoration on this bread.